A favorite old standby of mine. This goes with just about everything, and it’s a great “base” to use as a main dish if you’d like also. Just add some grilled shrimp, chicken, beef, even tofu. Of course, you don’t have to grill the meats, but it’s summer, and what the heck. If you’re grilling, make a little extra to throw into the salad for the next day. 6-8 oz. bag (I sometimes use more) of washed fresh spinach, torn into pieces. Baby spinach is good too, but you’ll still have to break it up a little bit. Prepare rice according to directions, but don’t use butter or oil that’s called for. Cool in refrigerator, or freezer to cool faster. Don’t forget it’s there! While rice is cooling, mix the vegetables together. Add the liquids, sugar and spices. Mix all together. Add cooled rice. Mix well. Serve. If you choose to add a protein, place pieces either on top of individual servings, or mix together. You’re choice. 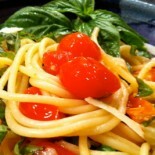 Garnish with parsley, a basil leaf, a pretty flower, or some of the red pepper. This is a “go to” recipe for me. I have been making it for over a year. It’s great to bring to a party as a side. I have I asked numerous times to bring it again for future parties. I am going to make it for a party tonight and plan to add shredded pickled beets and roasted zucchini. you can enjoy it right away if you’d like it warm, otherwise it’s fine to refrigerate. It’s actually good both ways. I usually serve it cooler or at room temp though. I made it in the morning 8 am for 7 pm dinner. Delicious. Good to let the favors meld. Leftovers were great next day so could most likely made it a day ahead too! I sometimes use Uncle Ben’s Long Grain Rice & wild rice… I think it only comes in one size. Thanks for asking.. I just made this. I made some small variations. I did a mixture of baby spinach, arugula, kale and fresh basil. Also, I added some slivers of radishes. Yummy!!!! Absolutely delish!!! Thanks! Sounds great! I’ll try those changes too- glad you enjoyed the spinach /rice salad! My pleasure! Let me know if you try it & how you like it. Thanks for your comment! 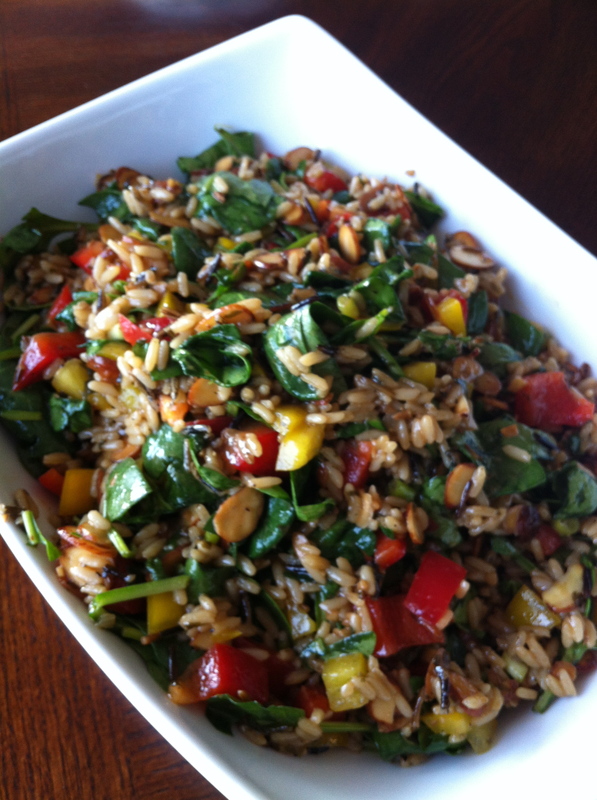 This entry was posted on June 22, 2012 by barbaralandfair in main dish, salad, side dish, vegetable, vegetarian and tagged almonds, main dish, red pepper, rice, salad, side dish, spinach, vegetables, vegetarian.